“I’ve never been in a room full of so many men in tights,” my husband whispered to me on Saturday morning. No we weren’t at the Nutcracker. 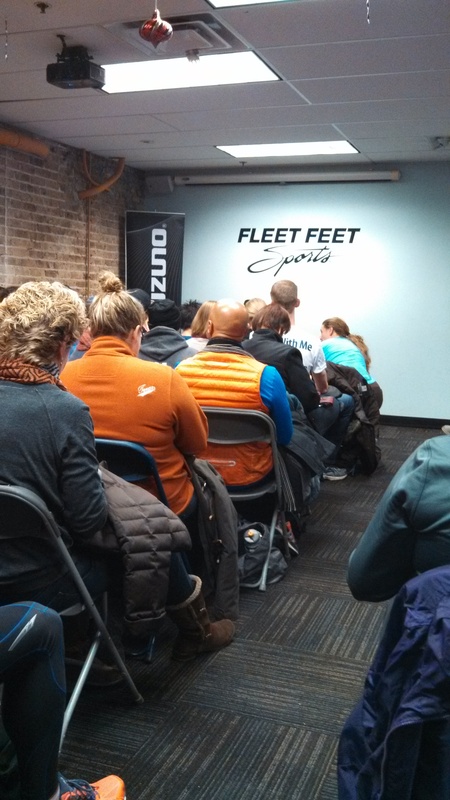 We were packed with about 100 other people at Fleet Feet in Chicago to hear esteemed writer and athlete Matt Fitzgerald speak about brain training. I had to chuckle. Almost everyone in the room (including us of course) was in running clothes. They had either run to the meeting or were running home after, heck some probably did both. Who wouldn’t want to leave a toasty room to run 8 miles in 10 degree weather along Lake Michigan?! First off I have to say that Matt Fitzgerald gave an excellent talk. He was very engaging and incredibly informative. He spent the majority of the session discussing motivation and how it differs from discipline. Runners are pretty disciplined, but at times lack motivation. This time of the year is one of the hardest times for us to get motivated whether it be to go for a run or even the most simple workout. For most of us it is cold and dark out, and we are bogged down with our careers, family, and holiday craziness. It is often difficult to get the motivation to go for a run and rather easy to make excuses about why we can’t run in the first place. Fitzgerald offered a few ideas for how to get yourself over the motivation hurdle and I would like to share a few that I found might be helpful for those of us needing a shove off of the couch and a kick out the door in the early morning hours. Chose a goal and make it something that excites you. All fall I had been “training” for a trail race after Thanksgiving with a few family members. I wasn’t training for a PR or trying to hit any particular time, but I was training all the same so that I could make it through the race and feel a sense of accomplishment. It made me want to get up in the morning and finish whatever runs or workouts I had planned for that day. If you need motivation, go seek it out with some inspiration. There are a few running books and movies I have watched that made me feel like I was ready to take on the world. I watched “The Spirit of the Marathon” during my marathon training and I spent an entire 18 mile long run thinking about the movie and wondering/imagining what it would be like to have the film crew following me. After I finished Matt Long’s “The Long Run” I wanted more than ever to embrace my ability and love for running. I could go on for hours on this one, perhaps for another post. Track your progress. I have gotten lazy in this department, but when I first ran I started keeping track of how many miles I ran each day and what other workouts I added. By keeping track of what you are doing, you are providing yourself with some feedback. When I started to see that I could do 3 miles consistently, it was easier to challenge myself to go to 5 miles and beyond. And my favorite recommendation…buy something cool. If you are lacking motivation, here is your excuse to say that all you need is that new running outfit you’ve had your eyes on. In all seriousness I think everyone can agree that sometimes having that new hat, jacket, pair of running tights, etc. has made your next few runs exciting and worth looking forward to. You could make it a double whammy and create a challenge for yourself, such as promising yourself that reflective running jacket you’ve been drooling over, if you run 4 days a week for a month. We are all different and our reasons for lacking motivation are also different. Look within yourself and find creative ways to encourage yourself to get those runs in. Remind yourself of how great you will feel once you have gotten it over with and remember anything is better than nothing. You can read about these and lots of other awesome running and training tips from Matt Fitzgerald’s books “Racing Weight”, “Iron War”, “The Runners Body”, and several others. ← Fess up, did you fartlek? !